This plug-in offers tight integration of system file manager (Windows Explorer, Gnome Nautilus, KDE Konqueror, Mac Finder, ...) and shell (cmd.exe, Linux/Mac terminal) in Eclipse. However, even if your system is not listed there, you can still easily configure StartExplorer to work correctly on your system. All options work with a single selected resource as well as with multiple resources. If multiple resources are selected and an option only works for files (or only for folders) all resources of the wrong type are ignored and the command is executed for the resources it is applicable for. Show in file manager: (Works for files and folders) Starts a file manager (depending on your system, this might be the Windows Explorer, Finder on Mac OS, Nautilus on Gnome, Konqueror on KDE, Thunar on Xfce or PCMan File Manager on LXDE) for the selected resource. If it is a folder, the file manager is opened for this folder. If it is a file, the file manager is opened for the parent folder of this file. On some systems (currently on Windows and Mac OS) the file is also selected/highlighted in the file manager. If multiple resources are selected, a separate file manager instance is opened for each resource. Start shell here: (Works for files and folders) Opens a shell/terminal/command line prompt with the selected folder as its starting directory. If multiple resources are selected, separate shells are opened for each of them. If a file is selected, a shell for its parent directory will be opened. Open files with default application: (Works for files only) Opens the selected file in the application that is registered for this file type in your system. If multiple resources are selected then for each resource the default application will be started separately. Copy resource path to clipboard: (Works for files and folders) Copies the absolute path of the selected resource to the clipboard. If multiple resources are selected, all resource paths are copied to the clipboard, separated by a Unix linebreak. The separator can be configured in the preference page for this plug-in. Custom Commands: You can configure any command you like here. These are the same options as for resource views like Navigator, Package Explorer or Project Explorer. The difference to the commands for resource is that these commands work based either on the file that is currently opened in the editor or based on the selected text region in the editor. 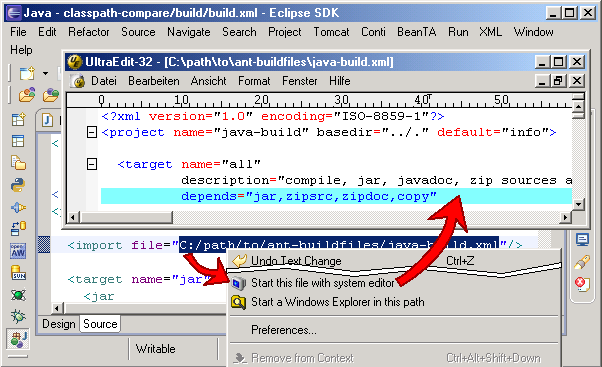 If no text is selected, the operation is executed on the file currently opened in the editor. This basically works the same way as if the file in the editor would have been selected in a resource view like Package Explorer. 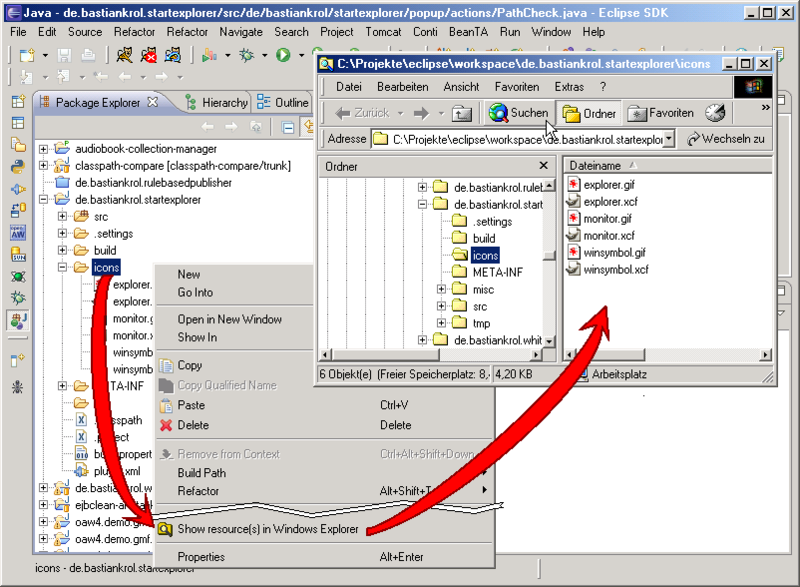 If some text is selected, the plug-in behaves quite differently and it is important to understand how StartExplorer works with selected text regions, otherwise you might get unexpected results: When text is selected, the plug-in interprets the selected text region as a file system path, denoting either a folder or a file. If this path is a folder, the plug-in can open a file manager or a shell for this folder. If the aforementioned path refers to a file rather than a directory, the plug-in can start the default system application for it. Actually, StartExplorer is a bit smarter when handling selected text regions than the last paragraph may give the impression. If you try to open a file manager for your selection it doesn't matter whether you selected a path denoting a folder or a file. If the selected text region points to a file, the parent directory of that file is shown in the file manager and the file is selected, just as you would expect. Furthermore, if the path ends with an incomplete path segment, the last segment is discarded. Example: In your text file (or XML file or whatever) you have the path C:\path\to\some\directory\file.xyz. Now you select just C:\path\to\some\dire and start a file manager for that path. The plug-in recognizes that C:\path\to\some\dire is not a valid path and tries the parent directory C:\path\to\some. If this is a valid, existing directory, a file manager window pops up showing C:\path\to\some. If you select "Start shell in this path" for C:\path\to\some\directory\file.xyz then the directory C:\path\to\some\directory will be shown. Of course, the option "Copy resource path to clipboard" does not make a lot of sense with a text selection because it more or less only copies the selected text to the clipboard (with the difference that it might be reduced to a valid file system path, see above). But it still makes sense with empty text selections because in that case it copies the path of the file that is currently opened in the editor to the clipboard. The custom commands are completely configurable through the preference page, just as for the resource-based commands. Remark: These screenshots are extremely, utterly outdated. Somehow I've been always too lazy to create new ones. They may give an impression of the functionality nevertheless. Click the thumbnails for larger versions. 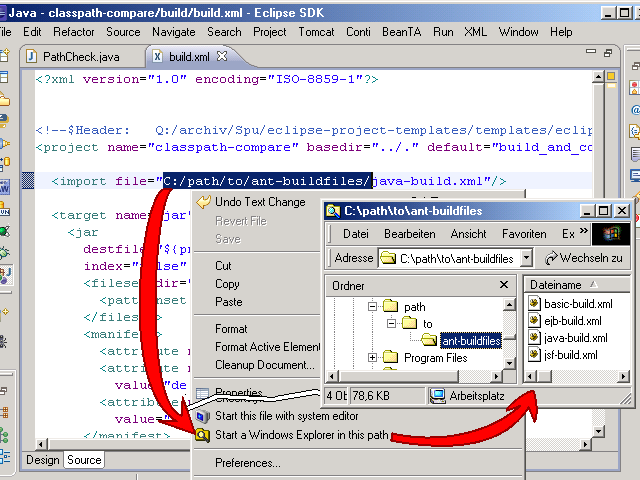 The plug-in provides comprehensive help documentation in the standard Eclipse way. Go to Help - Help Contents and choose the category StartExplorer Help. This help is also available online. If you have some thoughts about StartExplorer, be it a bug report a feature request or whatever, use issues section of the project's GitHub page. If the plug-in does not work properly in your environment or if you have an idea for a nice feature that would be suitable for this plug-in, just go ahead and tell me. If you want to get in direct contact with me, you might also use the GitHub facilities to send me a message. There is always more than one way to skin a cat. Or to open a file manager window. It seems many people miss this functionality in Eclipse and some of them (like me) wrote plug-ins to ease their pain. I'll list all I know of here. If you know another open-file-manager-plug-in, let me know. I also list some pros and cons, which, of course, are completely subjective.